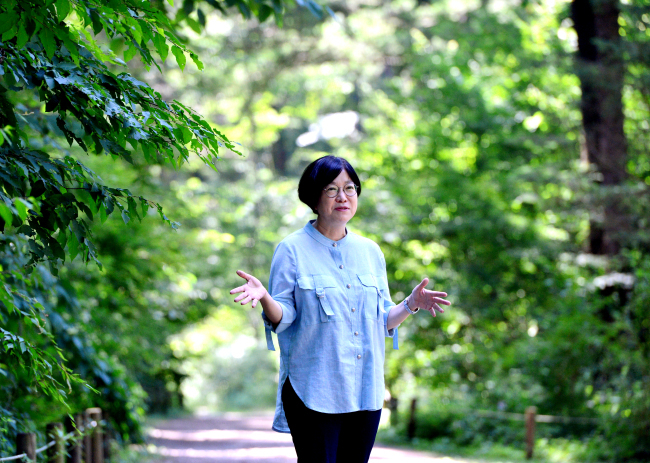 POCHEON, Gyeonggi Province -- At first, the achievements of Lee You-mi, director general of the Korea National Arboretum, as the first woman to be tapped as the chief of the organization in 2014 may simply sound genteel and classy. But just minutes into talking with Lee, there is so much more to her and her story. While the stereotype of botanists are of those examining plants in a research lab, Lee said they are in fact adventurists, setting out to explore and find rare plants in wildlife. Nicknamed “flying squirrel” for the slew of rough expeditions she has completed, Lee recalled two major projects -- one local and one overseas-- she took part in as a graduate student. Her first-ever expedition was a yearlong joint project named “From Halla to Baekdu” with a local newspaper and fellow academics studying plants across the country. “For a year we went around the country searching for plants from the southern part of Hallasan (on Jeju Island) all the way around Baekdusan (on the North Korea-China border). Some roads had not been built at the time. It was a tough journey, but through the experience I grew fond of plants and got a firm grasp of when and where flowers blossom and fall in Korea,” Lee said during an interview with The Korea Herald at the KNA in Pocheon, Gyeonggi Province. 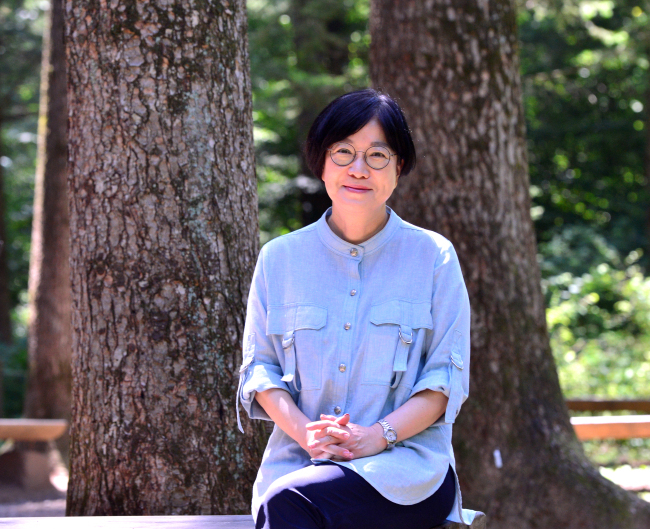 Nominated as the director general of the KNA in April 2014, 56-year-old Lee is the first female employee and first researcher to rise as a high-ranking official in the 47-year history of the Korea Forest Service. During an expedition to the Kamchatka peninsula in far eastern Russia to study plants rare in Korea, Lee lost her luggage while the mountain she had initially planned to examine was damaged in forest fire. In a last-minute change of plans Lee hopped on the back of a horse and headed to a nearby volcanic village. “Lingonberry is extremely rare in Korea, but it was literally all over the place there. It was impressive scenery to watch the horse step on lingonberry on the way to the new destination. And because I lost my luggage while transferring flights I bought hoes, bags and other tools at a local market, and borrowed comfortable working pants from the Russian owner of the bed-and-breakfast,” Lee recalled. Such challenges and explorations was the foundation for KNA’s distribution chart of 2,945 local plants released last November, securing sovereignty of plants grown here. Lee became a researcher at the KNA in 1994 after graduating Seoul National University’s college of agriculture and life sciences. Lee is now also the author of a steady seller containing information and pictures of 100 different trees grown in Korea, published in 1995, the year after Lee joined the KNA. “I didn’t want to make the typical choice of studying medicine in university, which was then highly preferred among female students, so I decided to pursue studies at the department of forest sciences at the recommendation of a professor,” Lee said. Lee was the sixth female student to attend SNU’s department of forest sciences. Strong and motivated, Lee said her favorite plant these days is Anemone narcissiflora, of the buttercup family. “It is not easy to choose one specific plant as a favorite. But recently Anemone narcissiflora that bloom in the cold early March days has caught my attention. Like a trailblazer, the small and fragile flowers prepare all winter long to melt frozen land and bloom. It is marvelous to watch the beautiful plant burst out from cold soil,” Lee said. Prior to explaining in depth about different projects Lee manages as the chief of the KNA, she defined the role of the state-run research center. “Unlike what most people think, exhibiting various plants accounts for less than 20 percent of the KNA’s role. Our main job is to research, categorize and preserve plants and animals” Lee said. Gwangneung Forest, where the KNA is located spanning across 2,240 hectares, was designated as a forest for the royal family in 1469 in the Joseon era under King Sejo. It is home to some 5,700 species, including 865 plants, 3,925 insects and 175 birds. Out of 571 rare species in Korea, 441 were collected at Gwangneung forest, surpassing the goal set for member countries of the UN’s Global Strategy for Plant Conservation by 2020. Among projects she oversees, Lee is particularly keen on restoring plants at the Demilitarized Zone, where the KNA opened a botanical garden in 2016 under Lee’s leadership. “The DMZ botanical garden was established to prepare for a beautiful unification. One of the utmost important tasks of the facility is to restore soil in the DMZ that has been destroyed by barbed-wire fences and years of removing plants for visibility by planting species originated in each region,” Lee said. By recovering plants and flowers unique to each region across the 248-kilometer DMZ, Lee pictures a day when the DMZ becomes an ecotourism spot upon unification. The KNA has spent eight years in preparing to open the botanical garden there, which currently preserves some 1,000 species of plants. According to Lee, conducting research in the DMZ is not an easy process due to the large-scale land and restricted military zones, and the KNA has completed research on about 23 percent of the area. One of Lee’s goals as the director general of the KNA is to fill in the incomplete half of the plant distribution chart for North Korea. On a personal level, Lee aspires to become more like Manchurian fir, or Abies holophylla, the trees she suggested as the background for her interview photos.